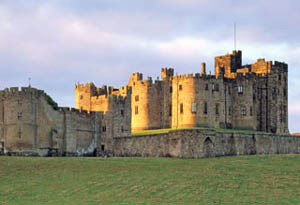 Alnwick Castle is a castle and stately home in Alnwick, Northumberland, England, UK and the residence of the Duke of Northumberland, built following the Norman conquest, and renovated and remodelled a number of times. It is a Grade I listed building with spectacular gardens. 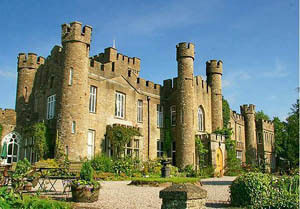 The castle has been used in many films and television programmes. 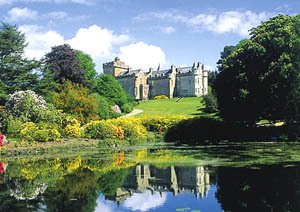 Augill Castle is an award winning family-run boutique castle hotel. It has been awarded Bed & Breakfast of the Year and is a grand country house as well as a family home. Rooms at Augill Castle are traditional and quirky. There are fourteen bedrooms or family suites, all of an equal high standard, each with a very different character. Some have four poster beds, others four poster baths. There are turrets for wardrobes, stained glass windows and big views towards the Lake District and the Yorkshire Dales. Bedrooms are decorated with bold colours and furnished with antiques. The owners are friendly and flexible, and are happy to provide a wide range of services tailored to to your requirements, whether you are planning a vacation, an activity holiday, private party, business conference or wedding. It lies within a 3,000 acre (12 km²) park of rolling pastures, lakes, and woodland landscaped by Capability Brown. It is open to the public. Facilities include cycle hire, adventure playground, events (antique fairs, lectures etc) ,park tours, group visits, shop and tea room. 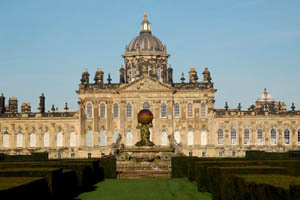 Castle Howard has been the home of part of the Howard family for more than 300 years.It is one of the largest country houses in England, with a total of 145 rooms. The castle is familiar to television and movie audiences as the fictional "Brideshead", both in Granada Television's 1981 adaptation of Evelyn Waugh's Brideshead Revisited and a two-hour 2008 remake for cinema. 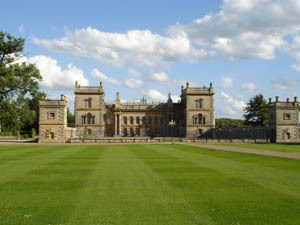 Today, it is part of the Treasure Houses of England heritage group. 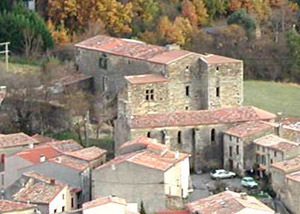 This is a rare castle - a genuine Cathar Château that is still inhabited. It was built by Guilhem de Planh (Guilhaume de Plaigne) a key figure in the events at Avignonet in 1242 and the tragedy of Montségur 1244. The Chateau was sold the Knights of Malta (The Knights Hospitaller or Knights of St-John) in the seventeenth century. It has been completely refurbished as a handsome private residence set in its own grounds and available for exclusive hire. It is available for weddings and other private functions, and for business conferences. It is located in the heart of Cathar Country in the Aude department in the Languedoc, between Carcassonne and Toulouse. The Château de St-Ferriol is a Late Medieval - Early Renaissance château fort in southern France. It is situated on a ridge, overlooking valleys to the North and South, in the heart of the village of St-Ferriol, near the towns of Quillan and Esperaza in the Aude Département and the Languedoc-Roussillon Région. 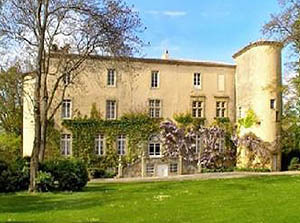 The Château de St-Ferriol was built in the sixteenth century towards the end of the period of medieval castle building. Gunpowder and firearms had rendered traditional castle building techniques obsolete, and medieval style castles were still being built only in remote areas - like Scotland and the Languedoc - where local wars still raged. The Château was listed (inscrit as a Monument Historique) in 1999 and is currently undergoing renovation so is not open to the general public, but three estate properties are available for long or short rentals. Blair Castle is the ancient seat of the Dukes and Earls of Atholl. 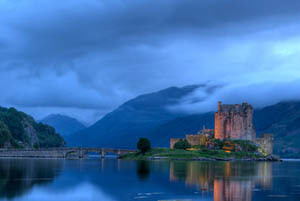 The castle enjoys one of Scotland’s finest settings in the heart of Highland Perthshire. The Castle has a long history, throughout which it has accumulated many fascinating historical artefacts, including antique furniture, art, period dress and arms and armour. The Castle, one of Scotland's major stately homes, is open for visitors on a daily basis (entrance charge). 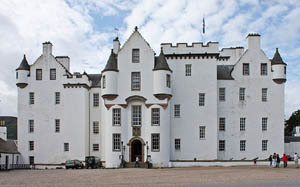 One of the first private homes to open to the public in Scotland, Blair Castle welcomes more visitors than any other. Eilean Donan Castle is a medieval castle on the small island of Eilean Donan in Loch Duich in the western Highlands of Scotland. The island is dominated by its famous picturesque castle. It is situated at the point where three great sea lochs meet, and surrounded by some majestic scenery, It is connected to the mainland by a footbridge and lies about half a mile from the village of Dornie. In 2001, the island had a population of just one person, but it is the spiritual home of many more since Eilean Donan is the home of the Clan Macrae. Today, you can explore nearly every part of the castle. The Castle now has its own visitor centre, which includes the Ticket Office, Coffee Shop, Gift Shop and toilets. Car parking is available at no charge. Large parties and groups welcome. There is no disabled or wheelchair access into the castle itself, but there is a computer-based Virtual Tour available for those that are unable to manage the steps. Floors Castle - the largest inhabited castle in Scotland. 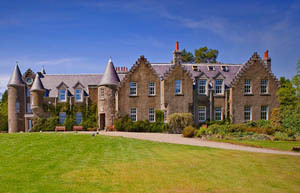 A unique Scottish visitor attraction with stunning interiors and magnificent gardens. 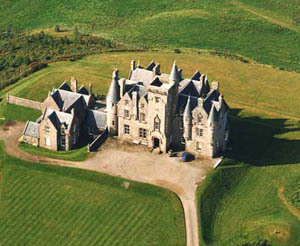 The Roxburghe Estate - a large agricultural and sporting estate and the family home of the Duke and Duchess of Roxburghe. 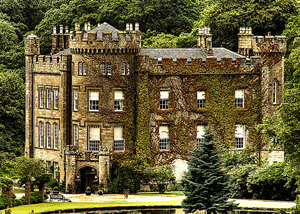 Glenapp Castle, formerly the family seat of the Earl of Inchcape, is located in Ballantrae, South Ayrshire, Scotland. The castle was built for the Deputy Lord Lieutenant of the County, James Hunter. 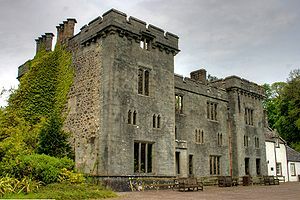 Designed by the famous Scottish architect David Bryce the Deputy Lord Lieutenant of Ayrshire at the time, the Castle was finished in 1870. 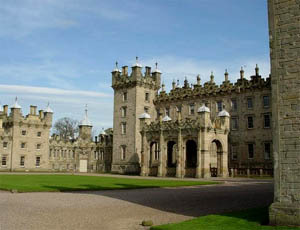 It is a noteworthy example of the Scottish Baronial style of architecture. The Inchcape family owned the castle from 1917 until the early 1980's. Pioneering aviatrix Elsie Mackay, daughter of the first Earl of Inchcape, lived at the castle until her death in 1928 in an attempt to fly the Atlantic in a single engined Stinson Detroiter. Situated on the Northern tip of the Isle of Mull near Tobermory, Glengorm Castle overlooks the Atlantic and has views over 60 miles to the Outer Hebrides and Islands of Uist, Rhum and Canna. The Castle was built in 1860 for James Forsyth and sits at the headland of Glengorm's vast area of coastline, forestry, lochs and hills. Glengorm stands apart from the surrounding Western Isles, known for its dramatic scenery, due to its tranquillity and sheer natural beauty. Powis Castle is a medieval castle, fortress and grand country mansion located near the town of Welshpool, in Powys, Mid Wales. Powis is one of the few places in Britain where a true baroque garden may still be seen. A great deal of work to restore and improve the gardens was undertaken from 1911 by Violet wife of the fourth Earl of Powis, including the laying out of the formal gardens at the far south eastern corner. The castle is the residence of the Earl of Powis, and is known for its formal gardens, terraces, parkland, deer park and landscaped estate. 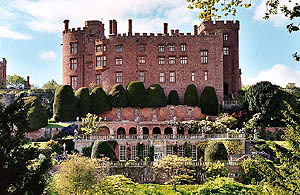 The property is under the care of the National Trust, which operates it under the name " Powis Castle and Garden".